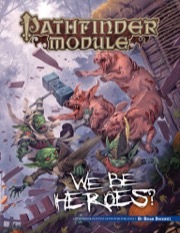 paizo.com - Pathfinder Module: We Be Heroes? We Be Heroes? is a Pathfinder Playtest adventure for four 1st-level goblin characters that gives players and GMs alike a taste of the upcoming Second Edition of the Pathfinder Roleplaying Game. The adventure adds a twist to the familiar modules We Be Goblins!, We Be Goblins Too!, We Be Goblins Free!, and We B4 Goblins!, Paizo's popular series of Free RPG Day adventures! Release: This special 16-page Pathfinder adventure was created for Free RPG Day on June 15, 2019. The print edition will be available for sale and a free download will be available on paizo.com beginning July 1, 2019. We Be 5uper Goblins is missing from the list. Woo! A new Goblin tribe and not having to wait until August for more P2? This is awesome and I can't wait to be able to run/play it. Which rules set will be used in this? Playtest rules or Pathfinder 2nd Ed rules? 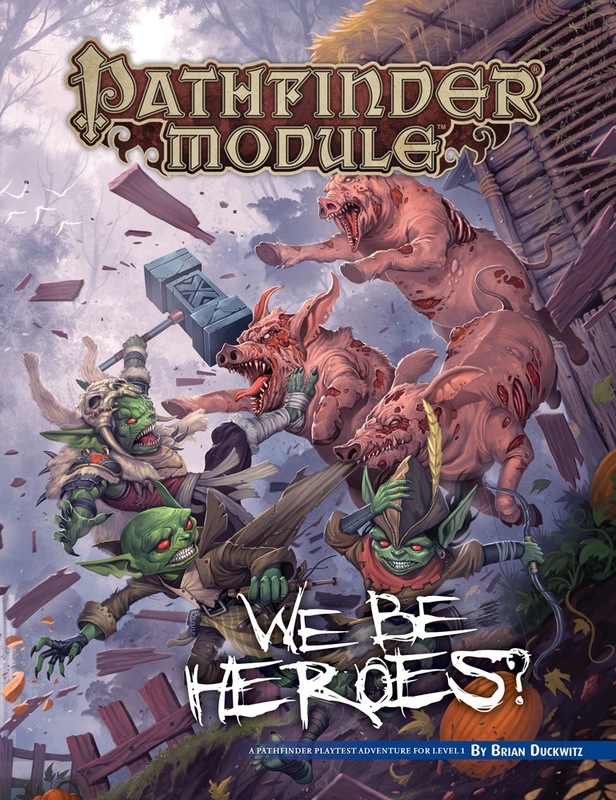 PF2: "gives players and GMs alike a taste of the upcoming Second Edition of the Pathfinder Roleplaying Game"
We Be Heroes? is a Pathfinder Playtest adventure [...]"
But that's really vague. It could mean anything from "uses the full rules" down to "here's what we're doing with goblins now." Very true. I guess we'll wait for someone in the know to weigh in. Why, it's clearly stated that this is an adventure for the Pathfinder Playtest rules. Yes, but what are those rules? The Playtest book? The 1.6 update? Are they really going to have stuff in the adventure (like Resonance) that we've already been told won't be in 2E? I'm thinking they're going to want it to be as compatible with 2E as they can as a preview and selling point for the game which will be released just several weeks later. It's certainly not going to use a ruleset that has not been published at the time of Free RPG Day 2019. They'll be as compatible as getting the print product ready for June will allow. Meaning: maybe fully, maybe not fully.